Your next patient is a 2-year-old girl with a 3-day history of high fevers, body aches, fatigue, and a rash. Her vital signs are; temperature, 40.5°C (104.9°F); heart rate, 105 beats/min; and blood pressure, 100/60 mm Hg. The physical examination reveals pustular vesicles with central umbilication in the same stage of development on her face, torso, and extremities. The mother says the lesions started in the girl's mouth 3 to 4 days ago. The patient's past medical history is notable only for severe eczema. What features of these illnesses suggest a potential bioterrorism threat? What patient(s) require isolation? What public health notifications are needed? The symptoms associated with most bioterrorism agents can be difficult to differentiate from common childhood illnesses, as most biological weapons are associated with clinical presentations that mimic nonspecific febrile illnesses. The febrile child is one of the most common presentations in the emergency department (ED), which increases the challenge of distinguishing a naturally occurring illness from a bioterrorism threat. Although children represent approximately 25% of the population in the United States, they are often disproportionately affected by disasters and public health emergencies,12 due to their unique anatomic, physiologic, developmental, and behavioral characteristics.13 (See Table 1.) Drugs used to treat most biological warfare agents have not been tested or used extensively in pediatric populations, and would likely be issued under an emergency use authorization or an investigational new drug protocol. 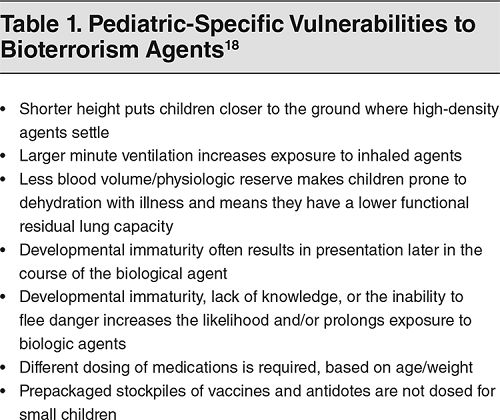 Lack of pediatric expertise, equipment, or disaster planning that included children could exacerbate the potential harms inflicted on pediatric victims of a bioterrorism attack. What features of an infectious outbreak distinguish it as a bioterrorism event? Why are children more vulnerable to bioterrorism agents? What resources are available to assist with a bioterrorism crisis? Who should be notified if there is concern for bioterrorism? How are bioterrorism agents diagnosed and treated in children? Which patients require decontamination, isolation, or quarantine? What can be done to protect hospital staff from potential exposure? Recognizing suspicious illness patterns is an important responsibility of front-line emergency clinicians. While infectious disease and infection control specialists provide specific expertise, the protection of patients and staff depends on adherence to recommended protocols as early as possible. Bioterrorism agents are often highly contagious and require public health support beyond the scope of any single healthcare facility. Specific protocols are important to best recognize and respond to the threat of bioterrorism. Any unusual cluster of presentations of Category A bioterrorism agents should be cause for concern. The inhalational form of any Category A illness should also be a red flag, as the aerosolized form of these agents is the most likely mechanism used for a bioterrorism attack. Children are particularly vulnerable to bioterrorism agents, due to their smaller size, developmental immaturity, behavioral characteristics, increased minute ventilation, and decreased physiologic reserve. The symptoms associated with most bioterrorism agents can be difficult to differentiate from those of common childhood illnesses, as most biological weapons are associated with clinical presentations that mimic nonspecific febrile illnesses. The United States Centers for Disease Control and Prevention (CDC) has designated the highest-risk bioterrorism agents as Category A agents. Diseases caused by these agents include, anthrax, botulism, plague, smallpox, tularemia, and viral hemorrhagic fevers. Anthrax (Bacillus anthracis) can infect patients via 3 routes of infectivity, depending on where the spores deposit: (1) cutaneous, (2) inhalational, and (3) gastrointestinal. The inhalational form is the form most associated with bioterrorism and should be considered in the setting of mediastinitis demonstrated by fever, shortness of breath, chest pain, and a widened mediastinum with pleural effusions on chest x-ray. Date of Original Release: December 1, 2018. Date of most recent review: November 15, 2018. Termination date: December 1, 2021. Specialty CME: Included as part of the 4 credits, this CME activity is eligible for 4 Infectious Disease CME and 1.5 Pharmacology CME credits, subject to your state and institutional approval. Faculty Disclosures: It is the policy of EB Medicine to ensure objectivity, balance, independence, transparency, and scientific rigor in all CME-sponsored educational activities. All faculty participating in the planning or implementation of a sponsored activity are expected to disclose to the audience any relevant financial relationships and to assist in resolving any conflict of interest that may arise from the relationship. Presenters must also make a meaningful disclosure to the audience of their discussions of unlabeled or unapproved drugs or devices. In compliance with all ACCME Essentials, Standards, and Guidelines, all faculty for this CME activity were asked to complete a full disclosure statement. ​The information received is as follows: Dr. Simpson, Dr. Behar, Dr. Bradin, Dr. Cicero, Dr. Mishler, Dr. Skrainka, Dr. Claudius, Dr. Horeczko, and their related parties report no significant financial interest or other relationship with the manufacturer(s) of any commercial product(s) discussed in this educational presentation. Dr. Jagoda made the following disclosures: Consultant, Daiichi Sankyo Inc; Consultant, Pfizer Inc; Consultant, Banyan Biomarkers Inc.